The sequence of steps above opens fdisk for /dev/sda. The p denotes the printing of the current partition table, which can be useful to see how many partition numbers there are, usually this will be /dev/sda1 for the boot partition and /dev/sda2 for the filesystem partition. Assuming this is the case pressing n will create a new partition, select p for primary, then select the next available digit (in this case 3 so we can create /dev/sda3). Then accept the default starting block and the default ending block. Once this is complete we need to set the type by pressing t then select the partition number (3) then choose 8e as the identifier for Linux LVM. Once this is done press p to confirm everything looks correct then w to write changes and q to quit. Once you press w you have committed the changes if you make a mistake press q and try again, this will prevent any erroneous writes from occurring. running partprobe will resync the partition table to the OS so that it can see the new partition, a reboot will do the same thing and may be required if the next step fails, however if possible to avoid a reboot it would be advisable. This creates /dev/sda3 as a new physical volume in the physical volume group. Next we will need to see what the volume group name is and then extend the volume group. If you are working with a physical machine or a VM that you are adding another disk to the process is similar to the above but moderately easier. Assuming the new device we are adding is /dev/sdb, if you are doing this without restarting the machine run partprobe before attempting the below command. If this doesn’t work a reboot may be required. This creates /dev/sdb as a new physical volume in the physical volume group. Next we will need to see what the volume group name is and then extend the volume group. If the VM does not show in the list it is definitely in this state. Check to see if any other VMs exhibit this issue and if they are on cluster shared storage. If you are using it make an exclusion for the Cluster Volume or disable AV as this is usually the culprit. Once you have located the GUID open process explorer as administrator and locate right click the VWP.exe processes and check the commandline entry under the “image” tab. This will display the GUID of the VMs. 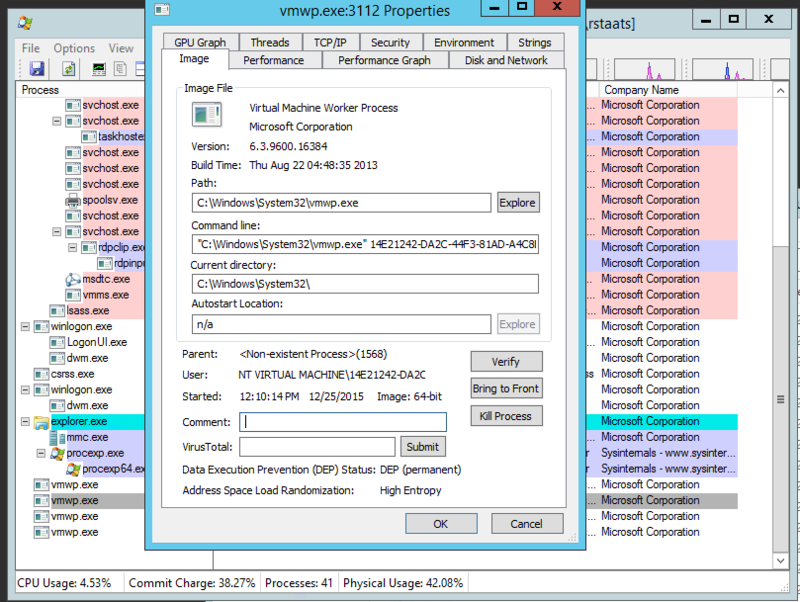 Select the VWP.exe that matches your trouble VM and kill the process. 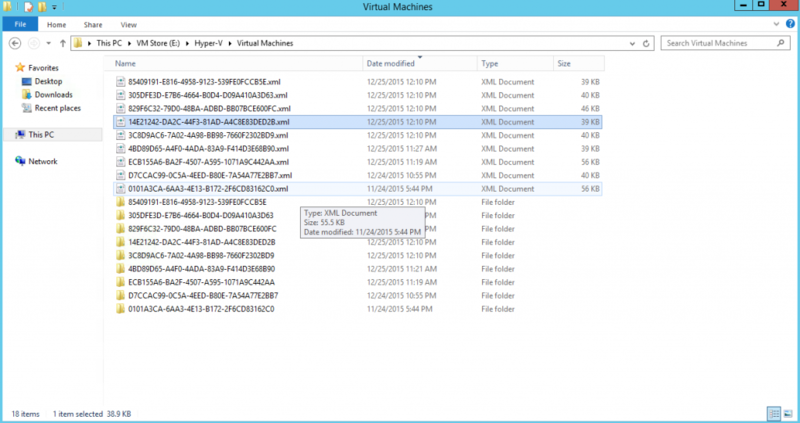 Once you have done this you will need to restart the Hyper-V management stack by restarting the VMMS process. I have found some of these will not work properly with the restart-service cmdlet, so you will need to stop and then start the service. This does not effect the running VMs, it only effects your ability to manage them while this service is stopped.